earlier this week I did a blog post http://imtesting.com/panda-penguin-and-affiliate-marketing/ about how if you do it right your affiliate marketing sites won’t get hit by Google updates like Panda and Penguin. Well, the price rise is closing in, it goes up at midnight on Sunday! This course is a step-by-step guide to profiting with simple affiliate sites. imho, it is the best, most up to date, education you can get your hands on showing exactly how you can rake it in as a Super Affiliate. The course has been completely updated for 2012, and it is newbie proof as they come! You’ll learn everything from chooseing a profitable niche, to monetizing it and more. There’s even a private members forum, where you can get your website critiqued. You even get to see an example (live) website built from scratch, from the very first niche and product research stages, right the way through to optimizing for SEO and building a newsletter/email subscriber list. Plus you get a cutting-edge affiliate theme, which is easily worth joining just to get your hands on that. I'm guessing that sounds like an odd blog title, how can you possibly (legally & ethically) build a responsive email list from people who unsubscribe for your list..? It's actually quite simple, if you have the right Autoresponder service. Although you should actually use two seperate autoresponder services. First of all I'm not going to claim this idea, I've been aware of it for some time, but I've only recently started using it myself in the last couple of weeks. Why have I started using it? Well I've started doing "email AdSwaps" more regularly over the last month or two, and this can obviously end up upsetting some of my subscribers simply because they are now getting more emails from me than they are used or would prefer. Well, with an Autoresponder service like AWeber you can set up your list to display an image (usually used for your company logo) when they hit the unsubscribe link in an email. 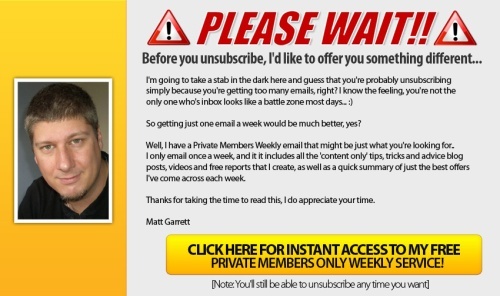 So you simply set up a graphic that has a suitable message, offering them a more reasonable alternative, such as a Weekly Only Summary email newsletter, and then link to the optin page for this. This new optin should ideally be on a totally different autoresponder to keep things truly seperate and make sure you know to never email that new list more than once a week, as per your agreement with/promise to your subscribers on the new list. The service I use is here All Contact and includes the option to also send SMS messages to people. That link will also give you a discount trial offer. Oh, and it's also one of the easiest to use mailing systems I've come across! To set up a graphic and link like this to try and 'save' unsubscribes go to your list in AWeber and choose "List Settings" from the "May Lists" tab, then click on the 2nd tab "Personalize Your List"
Click on the "Upload Your Logo" to upload the graphic and then pop the url for the optin page in the "Website URL" link. Simple as that, now you can start 'saving' 25-35%+ of your unsubscribes! On a seperate note, if you are an affiliate promoting aweber, have you grabbed/setup your aweber "subdomain" affiliate link yet? To set it up log in as an affiliate and on the "Home Page" under "Your Affiliate Information" there will be a link saying "(Customize Link)", click on it and then choose something unique for your "Custom Sub-domain:"
This is the most seriously clever traffic generation strategy I’ve seen in AGES! This new WordPress theme feeds of the incredible buzz around Pinterest by making your blog look, feel and work exactly like this super hot social networking site. It taps into the way Pinterest has already trained millions of people to use their site in a certain way. And when they do that, they will automatically share your site on Facebook and Pinterest – generating tons of free traffic and links for your blog. This is so extremely powerful it’s hard to find the right words to describe it. In the world of Affiliate Marketing, lots of people have seen their incomes slashed recently due to Google’s algorithmic changes (Penguin and Panda). Yet, while all this has been happening, some affiliates, like Mark Ling, have been busy making over 10k a month from affiliate sites. Great news is that it is NOT the end of affiliate marketing. These changes have actually brought about a fantastic new opportunity that very few are ready to capitalize on. Great news is that there is a ‘rinse and repeat’ blueprint for affiliate success, which takes into account Google Penguin AND Panda that you can copy and use right now. To celebrate the new edition launch of AffiloBlueprint, for the next few days, you can get in for over half off the regular pricing. There are also some special bonuses in place just for launch, so make sure you check it out as soon as you can. In this comprehensive course, created by internet millionaire, Mark Ling, you’ll learn everything from chooseing a profitable niche, to monetizing it and more. You actually get to see Mark build a website from scratch, from the very first niche and product research stages right the way through to optimizing for SEO and building a newsletter list. Plus you get to receive Mark’s cutting-edge affiliate theme, which is easily worth joining AffiloBlueprint just to get your hands on alone. New Test coming – Niche Marketing on Crack from Andrew Hansen..